The romance! The dogs! The Art! Get ready for a sweet film. Rob waited a long time to find MaryEllen--in fact, he gave his bride a ring on the wedding day with a diamond for each decade that he waited for her. 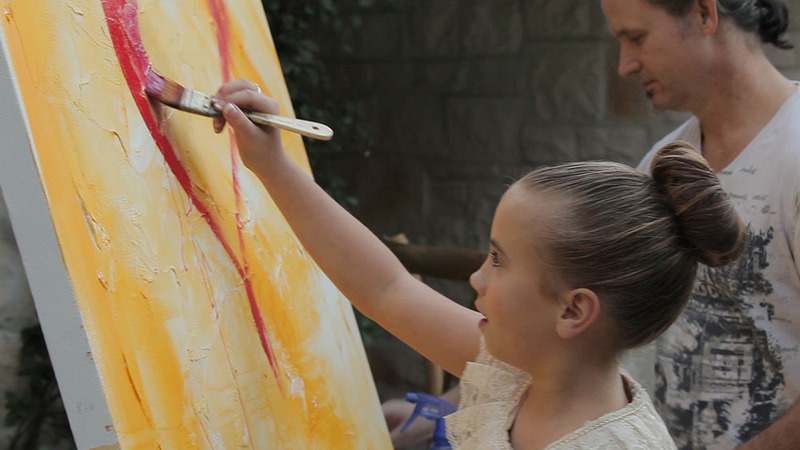 Between Rob's sweet romantic gestures, MaryEllen's stunning beauty, their flower girls' antics, and the ways they incorporated their love for art and for their dogs into their wedding day, their story is sure to make you smile. When we arrived at MaryEllen's Crown Plaza hotel room, photographer Taylor Lord was also just arriving to document the day. We've worked with Taylor before, and she's always great to work alongside. Edric's crew from Vanity Lounge was already in the midst of styling MaryEllen's hair and makeup. Her flower girls scampered about like little fairies, bringing delight with each sparkle in their eye and each grin. Meanwhile, at the house, the bartenders, chef, and waitstaff were already prepping a food course that just to describe will make your mouth water--including bite size smoked sausage with spiced poached apple, potato truffle waffle duck confit, tomato water shooters with buffalo mozzarella and basil foam, bacon wrapped jalapeño, and quail with sweet potato hash (and that's not even half of the hors d' oeuvres list). Mouth watering yet? The dessert table towered with a variety of cookies and cakes, including cookies designed to look like Gracie and Barcley, the furry pups that are owned by MaryEllen & Rob. 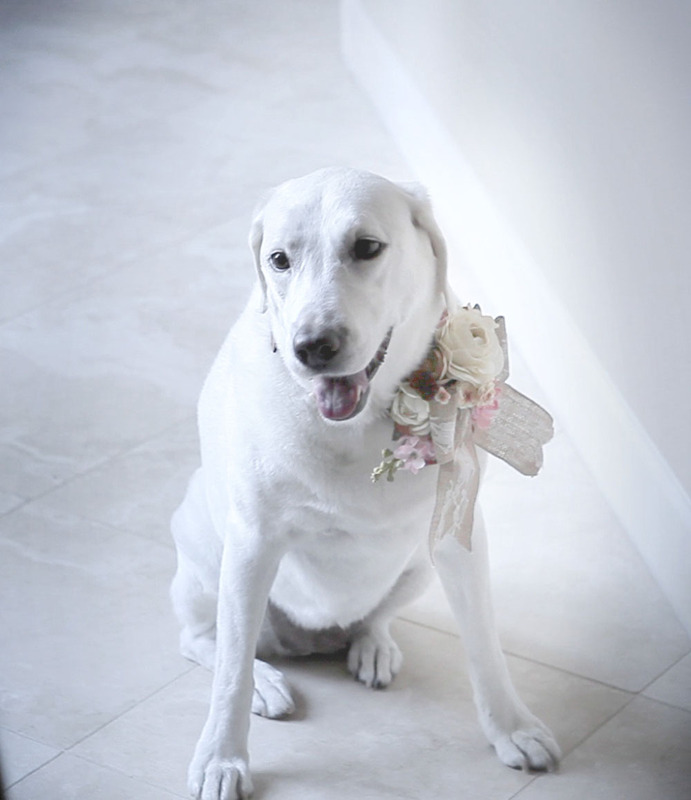 As the flower girls marveled at the dog-shaped cookies, adult guests were able to enjoy signature cocktail drinks named after Gracie and Barcley. 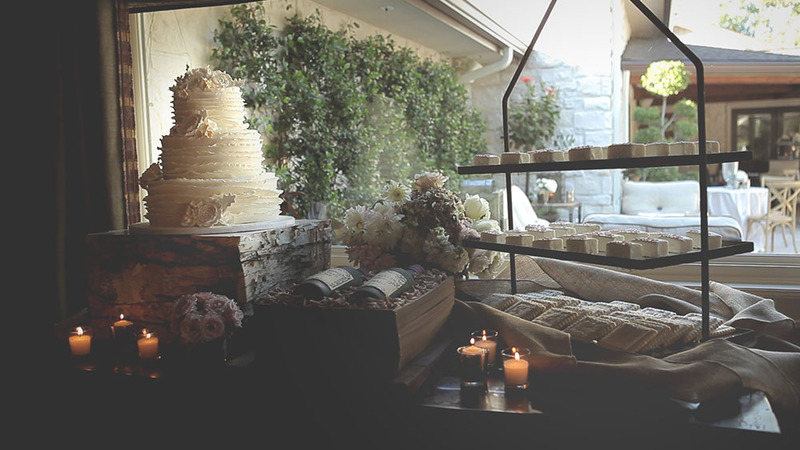 Seated on wooden pews in the backyard, friends and family gathered together all dressed in cream and buttery soft hues to celebrate the happiness of the bride and groom. 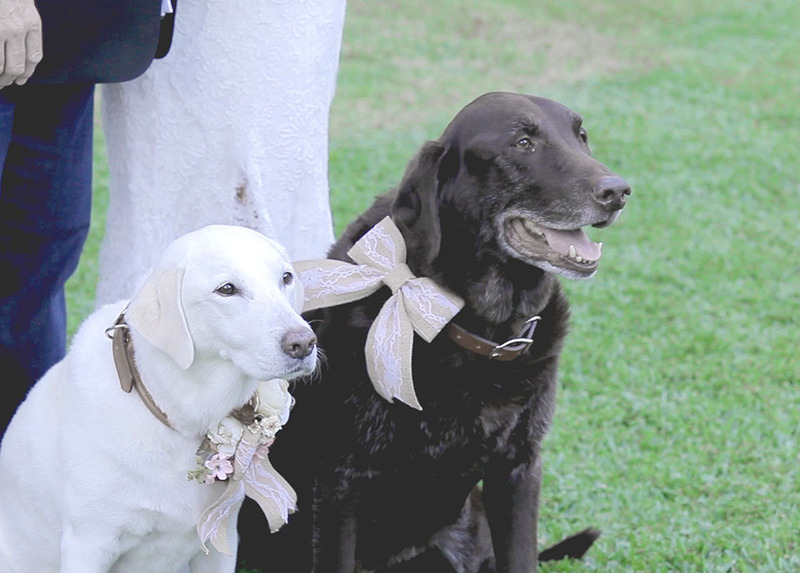 Gracie and Barcley looking dapper and sitting patiently for portraits after the wedding. 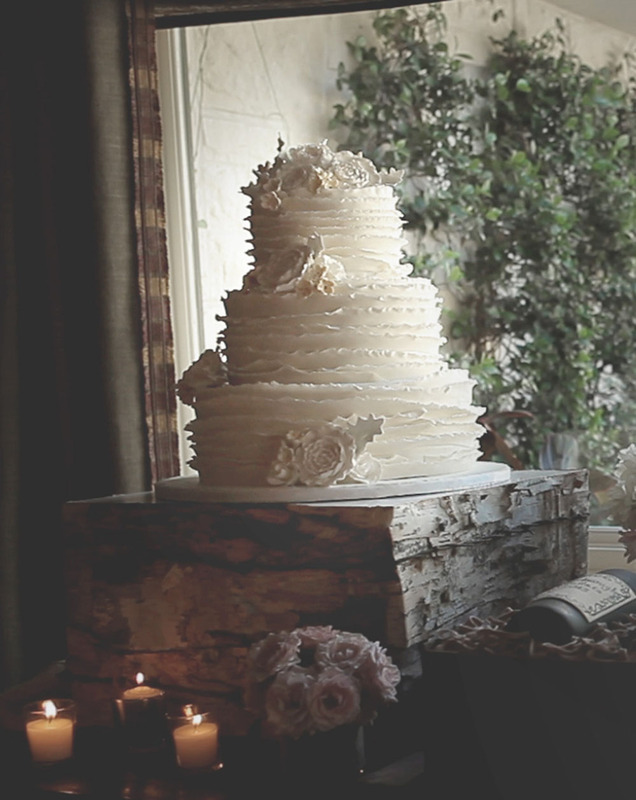 This white wedding cake by 'Who Made the Cake' has frills for days, and peonies to match. 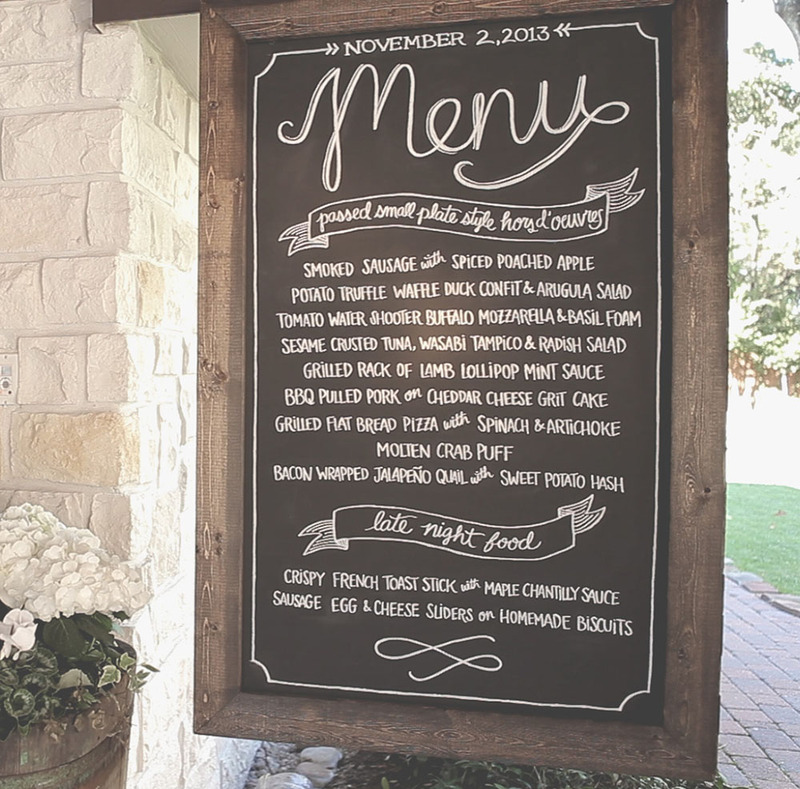 Custom water-color style script signage by Houston creative studio Papellerie beckoned guests to leave their mark on the large oil painting being created at the wedding reception. The bride commissioned the groom's favorite artist (Taft McWhorter) to create an oil painting on site at the wedding, and it was an awesome surprise gift for the groom. Their officiant told the couple during the ceremony: "The bible says, 'you saw me before I was born, every day of my life was recorded in your book, every moment was laid out before a single day has passed." The ceremony is over in a few moments, but what really matters is the lifetime that you're going to spend together." We couldn't agree more! Congratulations to MaryEllen & Rob, and thank you for choosing us to create an heirloom artwork to help you remember each moment of your very special day for a lifetime. Caricature Art: Satirical Effect Caricature Co.